450 s/n archival gicle'e prints, sold out. Very limited number of artist proofs available. ​I first stood in this spot overlooking Delaware's Great Dune in the early 1970s with my late husband on a stormy, cold, cloudy, blustery day. The next time I would stand there would be 40 some years later under entirely different circumstances. We'd been wandering around, first Rehoboth for pizza, then in Cape Henlopen State Park to watch the waves roll in from Heron Point. I had my first SLR camera with me and was thrilled when the pictures came back. Despite the weather, they were good and I vowed to paint one of the scenes. Fast forward to 2014. Now a professional artist with my own art gallery in a town not far away, I found myself back in the exact same spot taking photos of the view, but this time with a specific project in mind. I'd been asked to paint a commission for a very large financial institution and produce 350 prints for them to give to their best clientele. I wanted to make this painting memorable, something their clientele would be proud to have in their homes and had an idea. They'd ask that it be sunny, with bright green spring grasses and I had an idea. There is something I had seen over the years that I thought would be fun, though difficult to either get another glimpse of or portray. It took many visits to that spot over several weeks to view it long enough to get it right. Photos don't do it justice. Heron Point overlooks the southernmost juncture of the Delaware Bay and the Atlantic Ocean. At that juncture, you can see the Atlantic Ocean, the National Harbor of Refuge Lighthouse, and a little bit of the bay beyond a breakwater (stone barrier) which creates the National Harbor of Refuge for ships and boats going in and out of the bay to dock in Lewes, Delaware. There is a phenomena that occurs when the lighting is just right and a ferry boat is coming in or out of the Delaware Bay. Do you see it? A mirage makes it look like the ferry is floating not on the water, but above it. Do you see it? The print was painting and its prints were success. 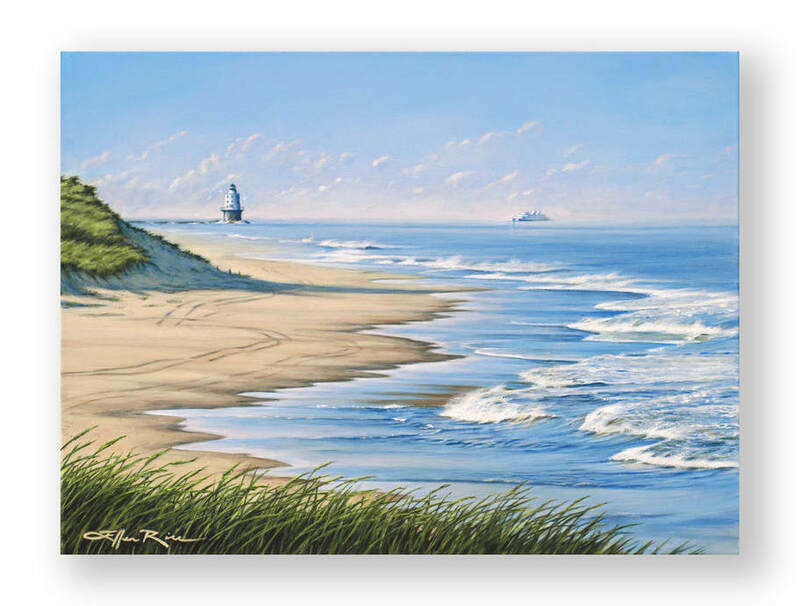 Presented to the bank's clients in three locations on three formal occasions, first in the city and then nearby in Rehoboth Beach, all 350 prints were gone quickly and they needed more. I was glad I'd made the edition 450. Over the next two months, they requested the rest of them, demand was so high. I heard later that it had been years since they'd had demand for so many. That made my heart sing - and it helped my gallery at a very crucial time, when road construction had all but shut my doors to the public for many months. I do have some full size Artist Proofs and some smaller gicle'e proofs available for anyone else who appreciates the view from Heron Point. Just click on the gold box above to see those options, and enjoy.